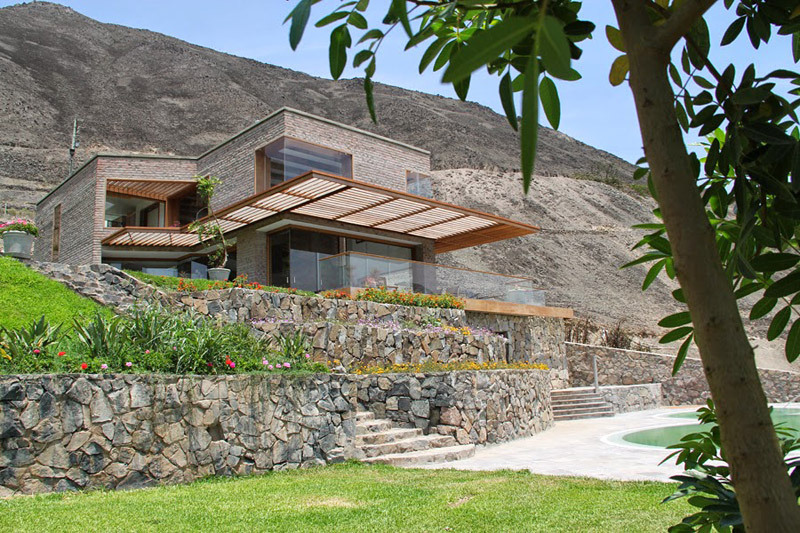 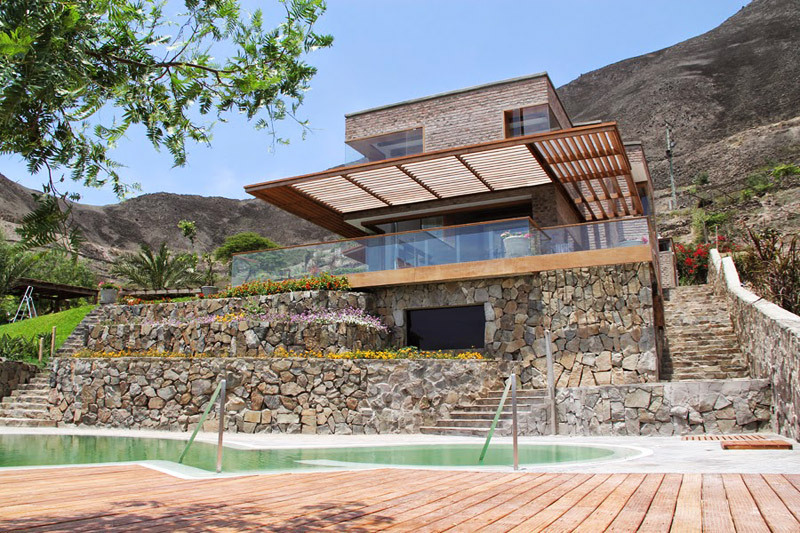 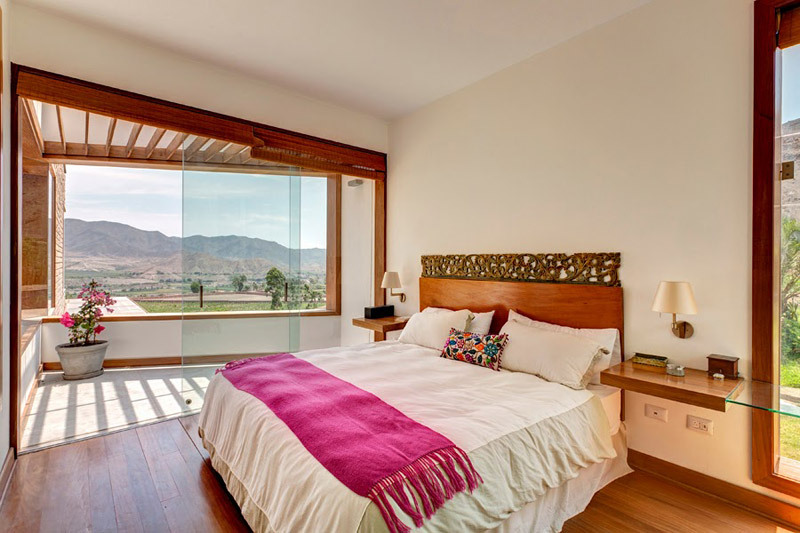 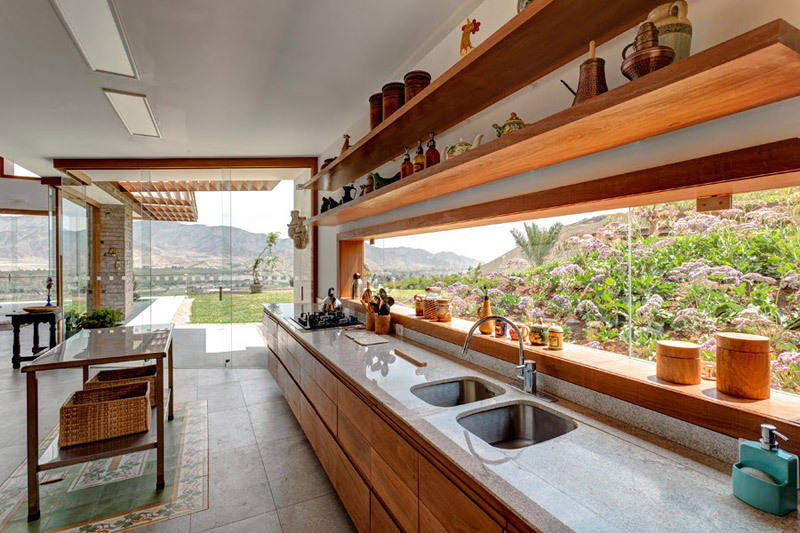 The Casa Azpitia is located in Azpitia valley, in the coast of Lima, Peru, approximately 90 Km south of the city of Lima and 20 km away from the seashore. 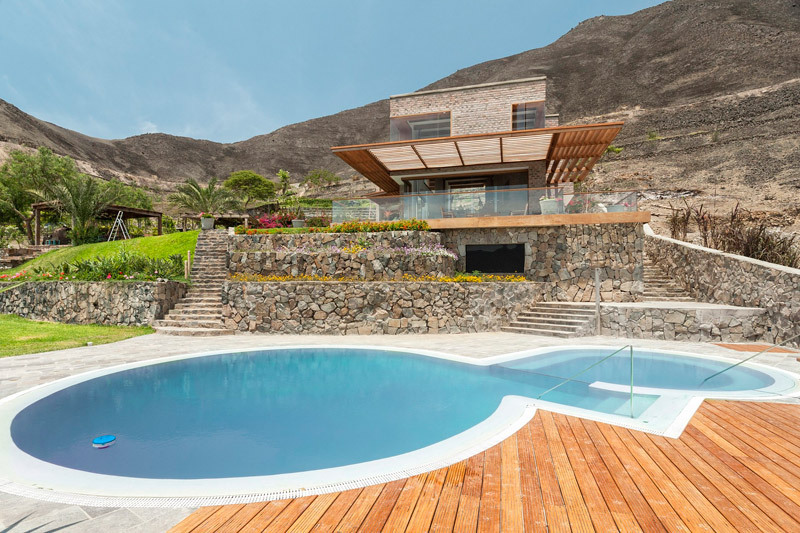 A place known by the local vineyards and its pre-columbian ruins; a kind of natural oasis for people escaping from the big metropolis of Lima. 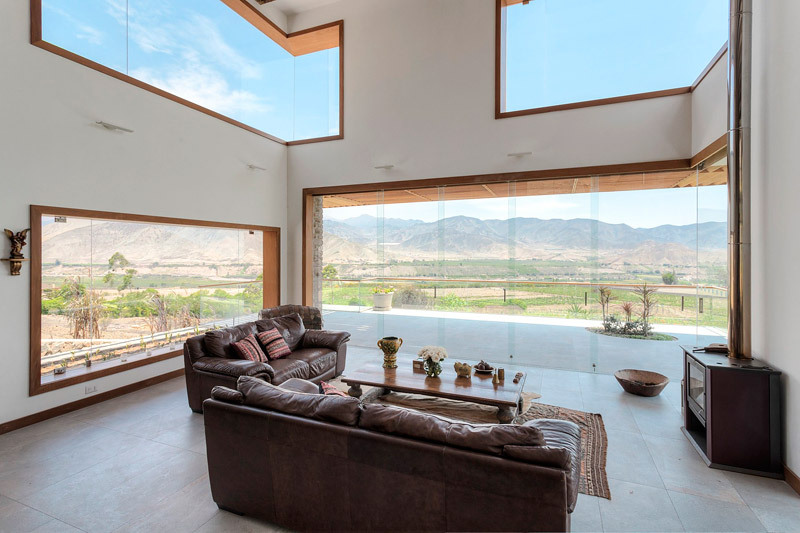 The landscape is characterized by the dryness of the desert that contrasts with green areas along the course of the river Mala from the mountains towards the Pacific Ocean. 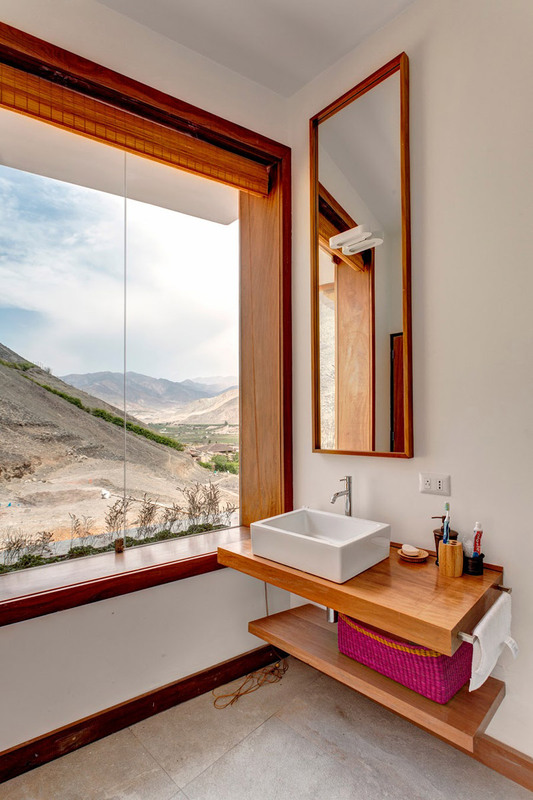 A valley consisting of small mountains and picks rising up from the desert on both sides of the river, changing colors from beige to light brown, to reddish, anthracite and soft grey. 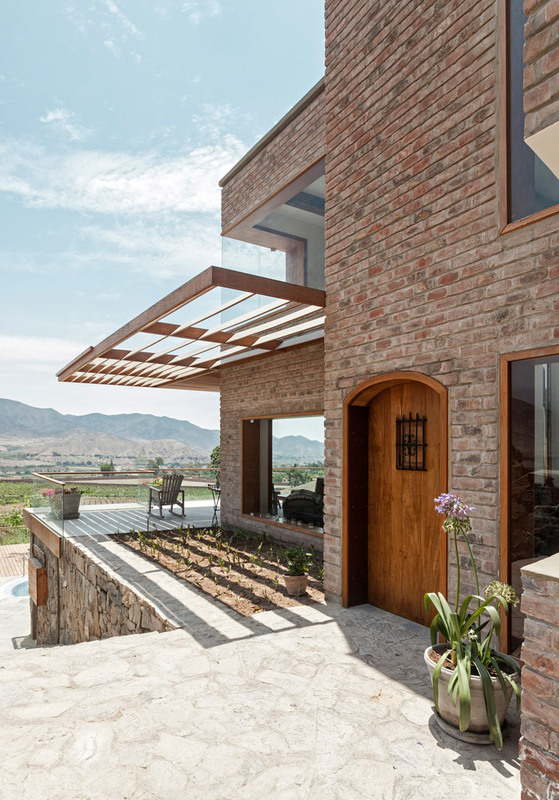 The house sits on a slope, at the foot of the mountain with a view to the path of the river Mala towards the sea, facing the vineyards. 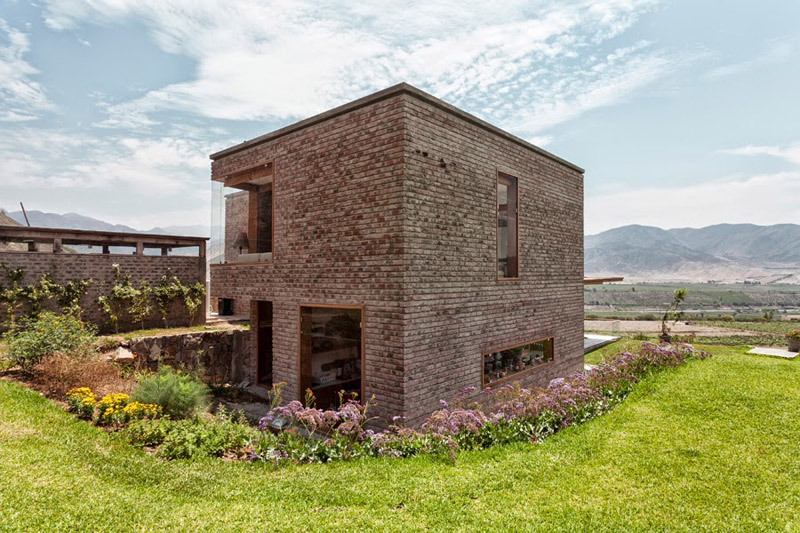 The project was intended to integrate the house with such dry landscape and to develop a geometry and a palette of textures and colors according to this environment. 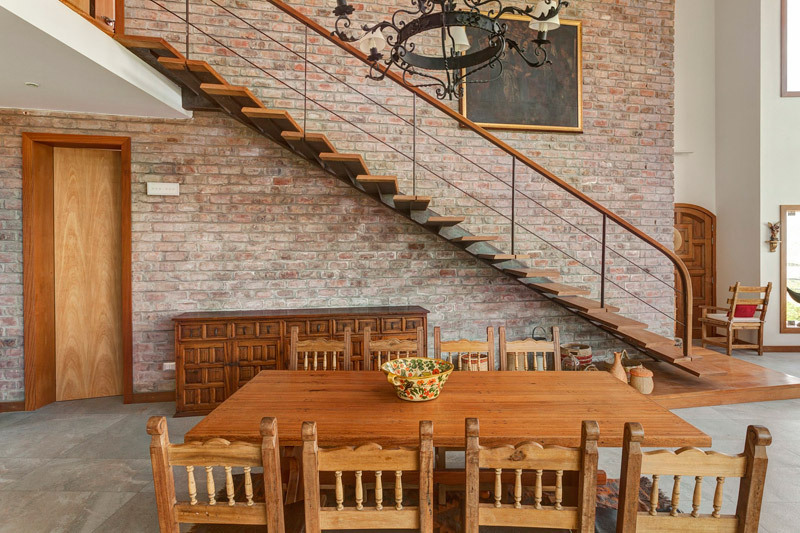 Rafael Freyre decided to work with local handcrafted materials and techniques, merged with other industrial ones. 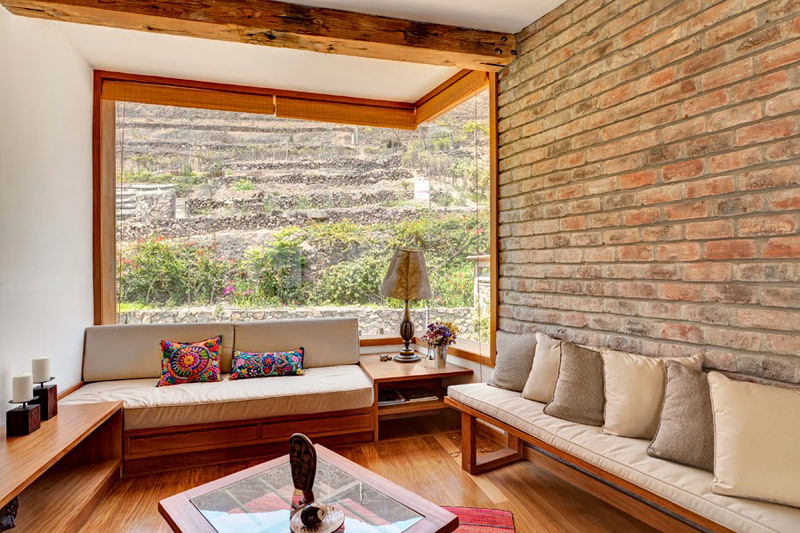 Twenty kilometers away from Azpitia, at the Chilca shore, they still found traditional local handcrafted brick ovens. 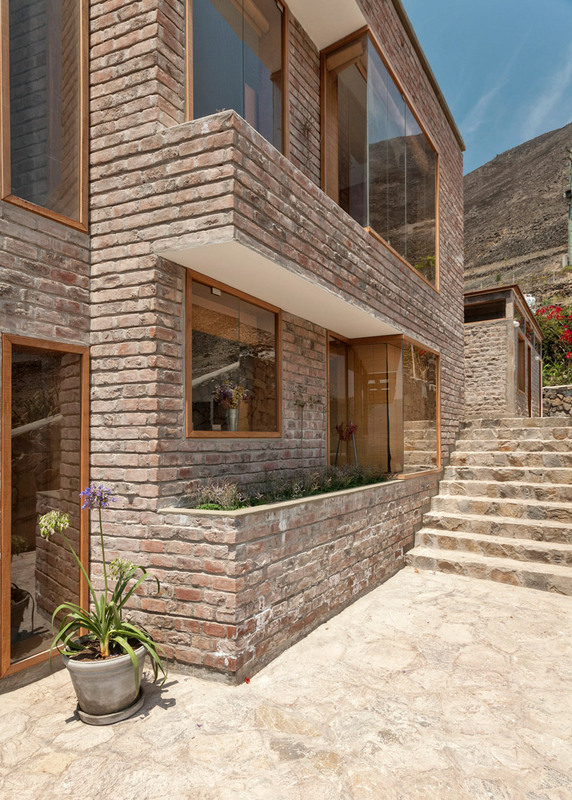 The bricks, made of clay and sand have thermal properties, an irregular texture and particular colors that relate to this dry landscape. 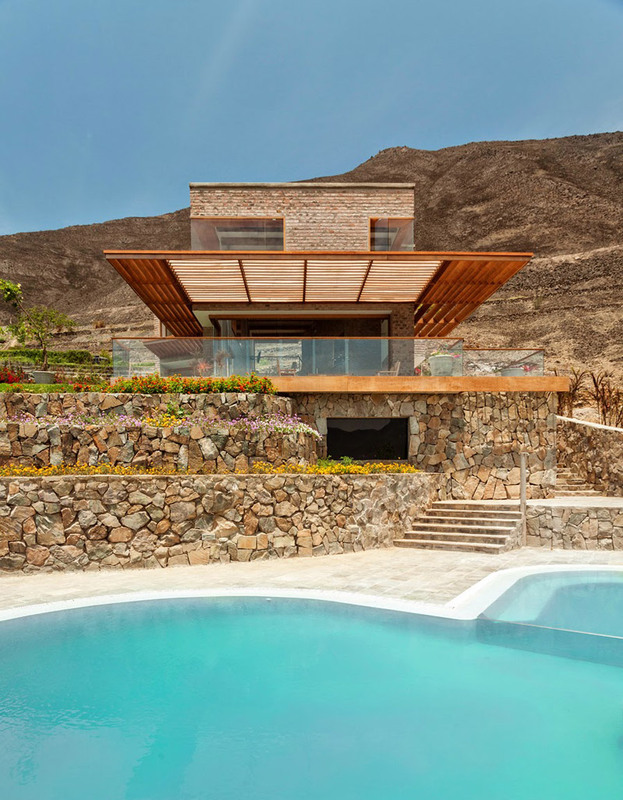 The foundation of the Casa Azpitia is composed of platforms – made from local stone – covered with xerophyte plants hiding the internal program of the Sauna. 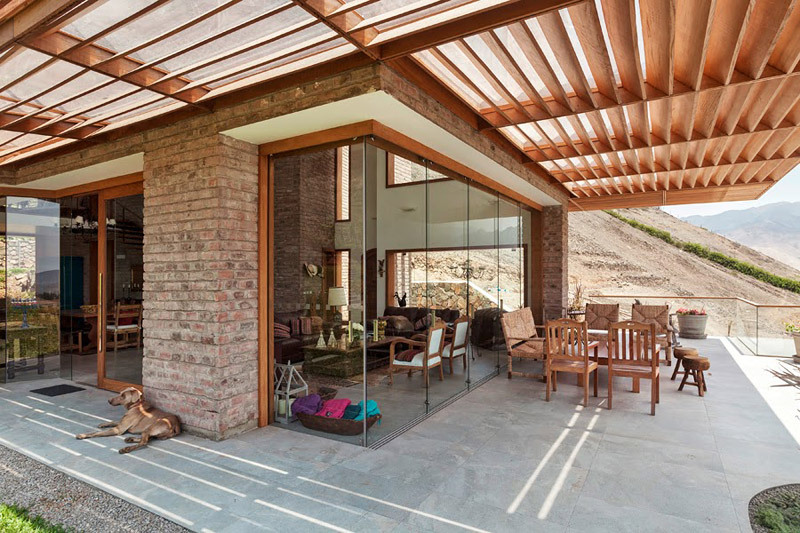 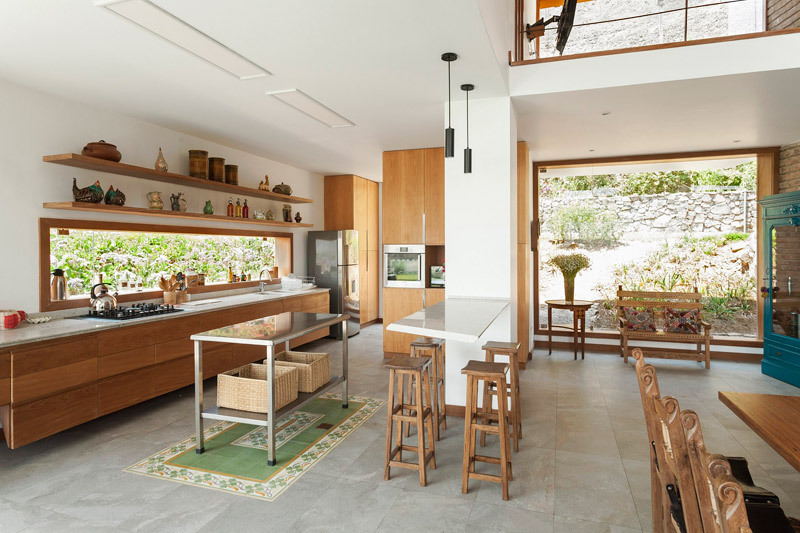 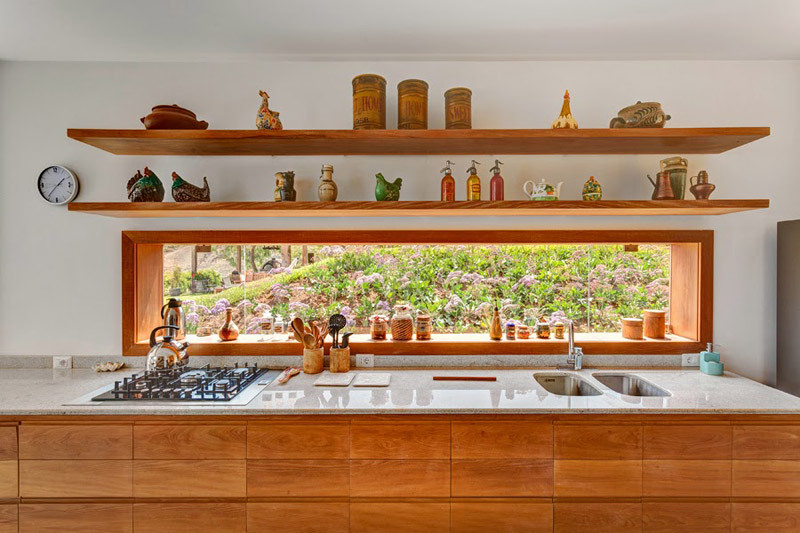 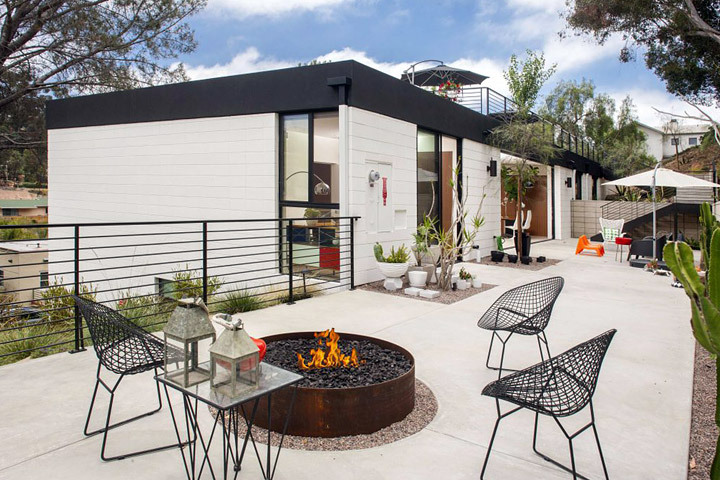 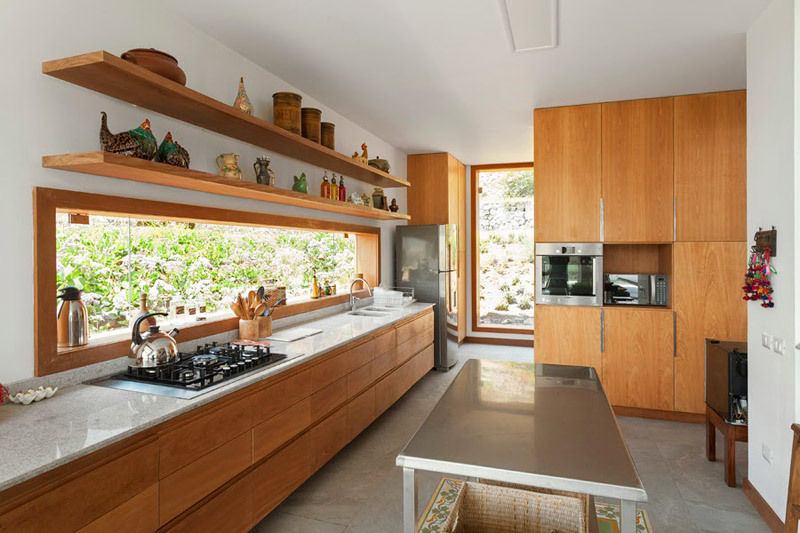 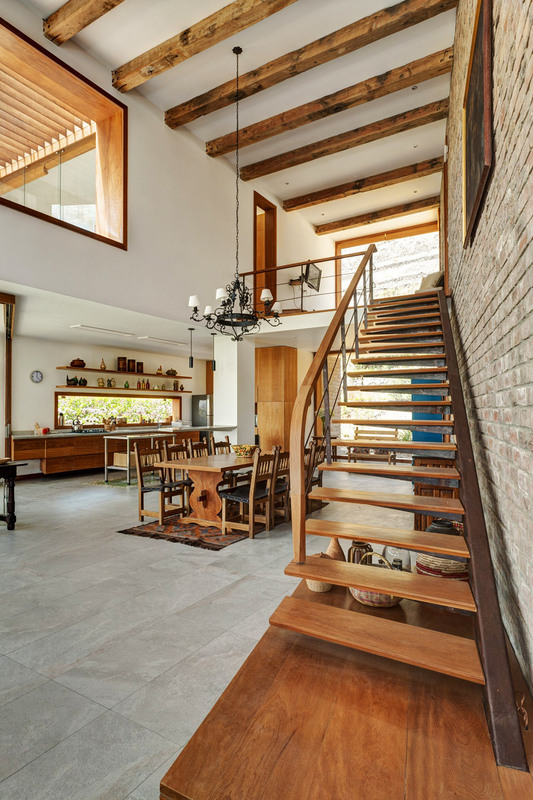 Above the stone layer is located the terrace: an extension of the social area -kitchen, dining room and living room- covered with a wood roof that protects form sun radiation. 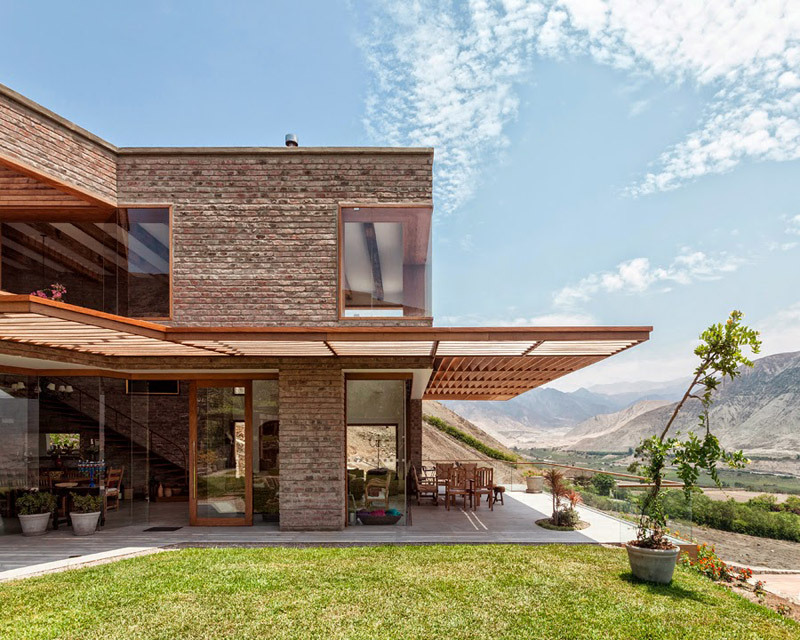 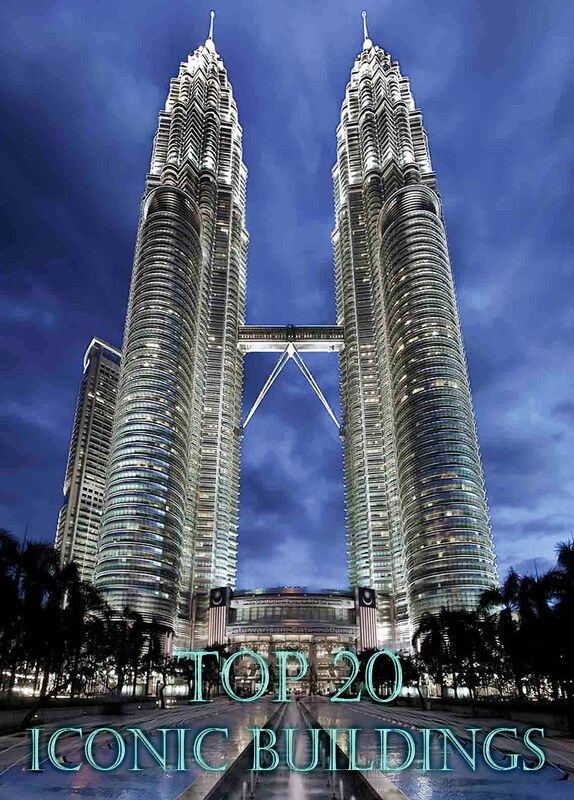 The roof is a kind of textile grid that allows light entrance. 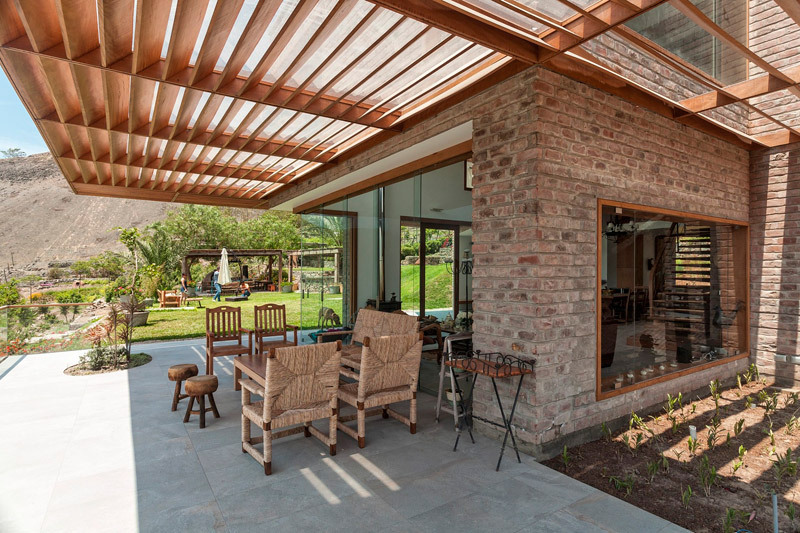 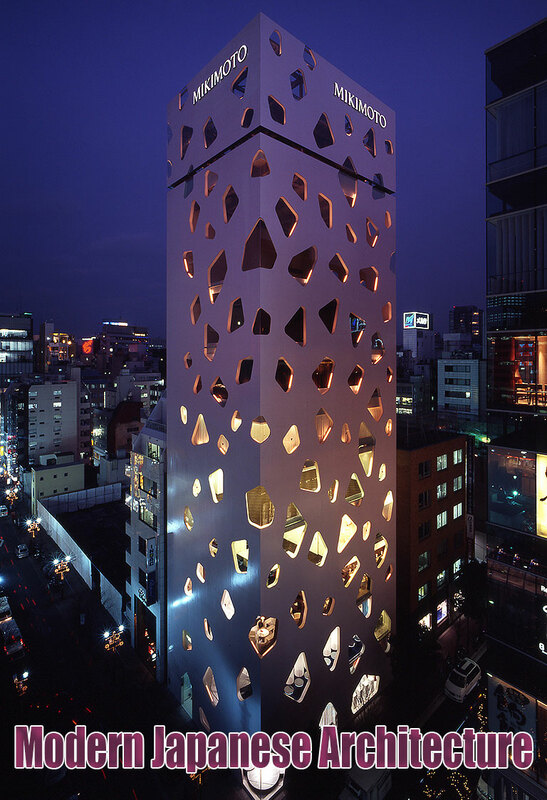 The grid is composed from a wood pattern developed according to the sun path, avoiding direct radiation. 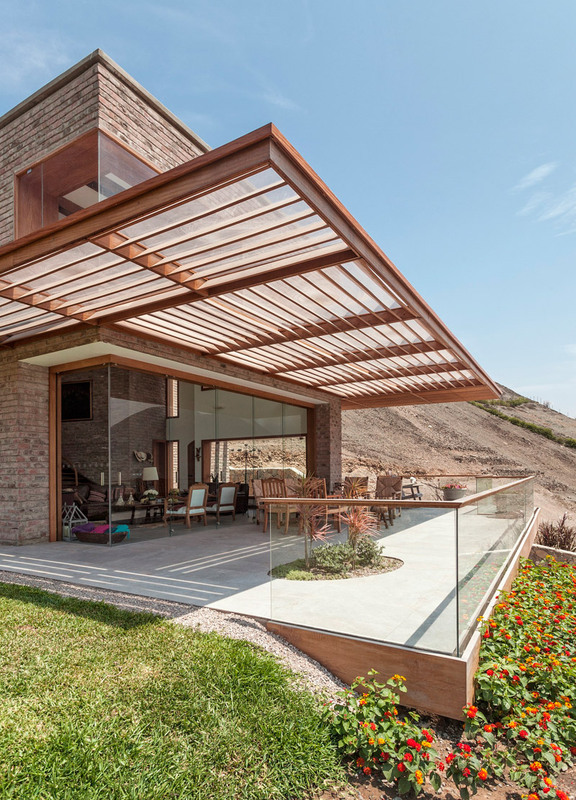 The roof, as an elementary architectural sign, creates a transitional space -shadow, semi-shade and open areas- projecting the interior life towards the outdoor space. 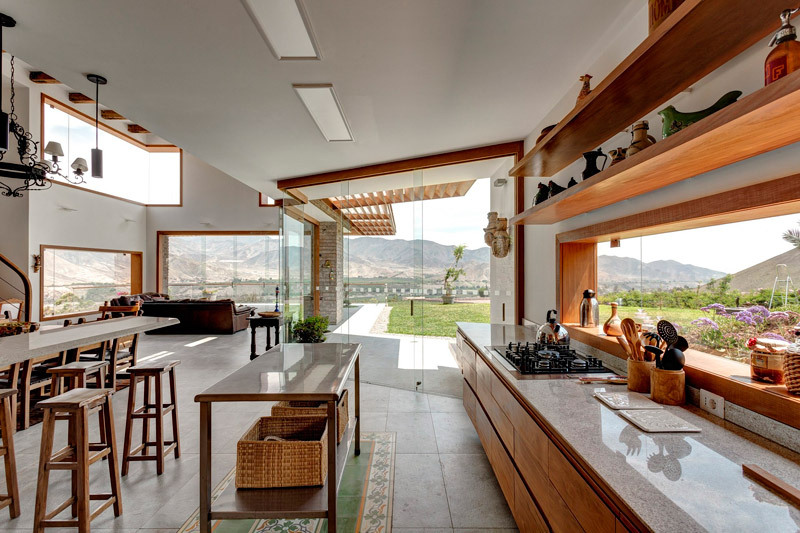 All the first level of the house, comprising the social areas, is an open space surrounded by gardens and views. 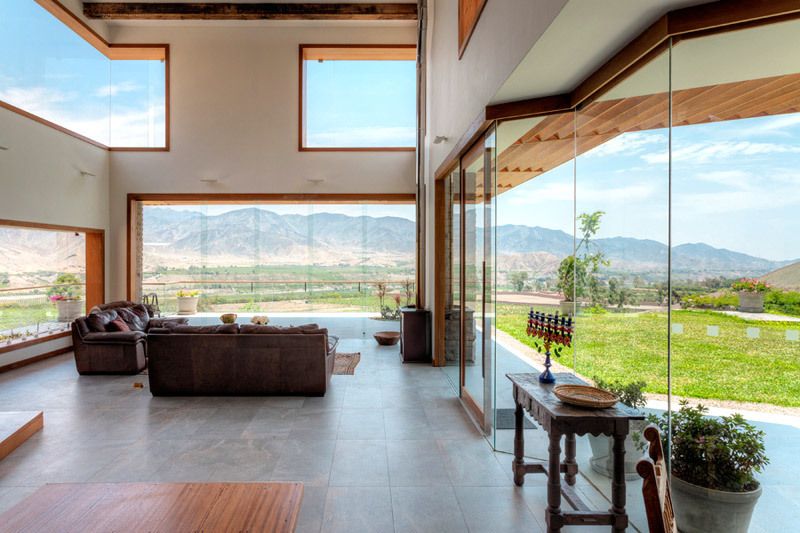 The second level contains the private areas: the main and secondary room, both framing special views of the valley. 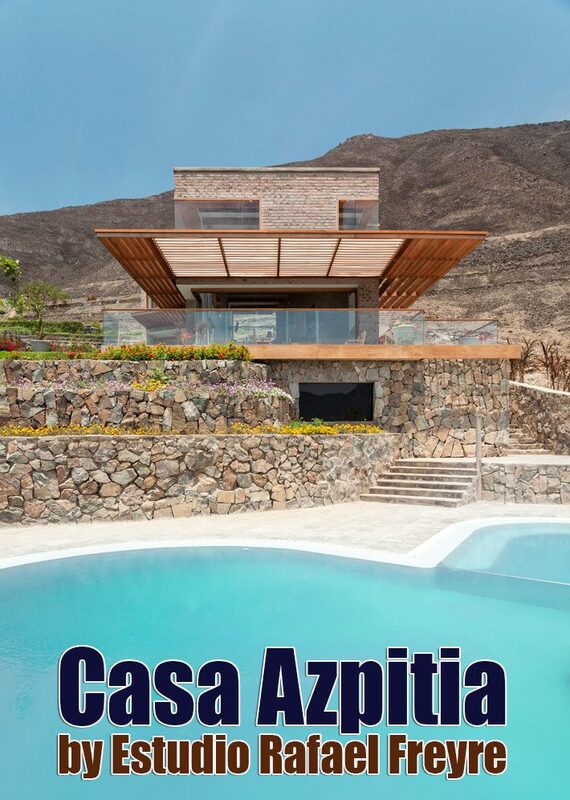 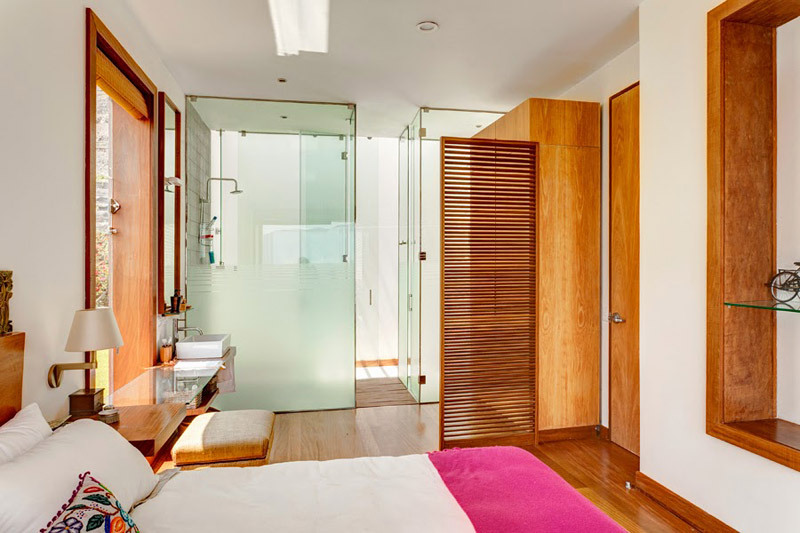 Casa Azpitia has an internal floor area of 240 square metres, and is arranged across three levels. 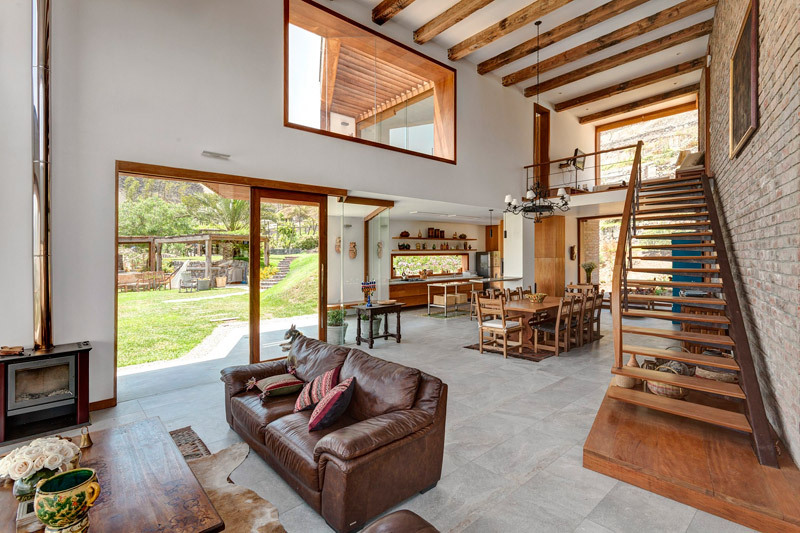 The basement houses a sauna, the ground floor has a kitchen, dining area and a double-height living room, plus a bedroom and en-suite bathroom, and the first floor has two more bedrooms with ensuites, plus a secondary living space by the stair landing for watching TV.